JDS Consulting is a lot more than just telecommunications parts. We are a full service telecommunications services provider. As we've worked with our clients, they've asked us to do more for them above and beyond what they initially contacted us for. We're always happy to help! Contact Centers today are being asked to interact with customers via more and more mediums such as audio, fax, web and email. This gives their companies competitive advantages in the marketplace, while increasing the complexity of managing performance, efficiency, validation of information and the protection of your company's assets. 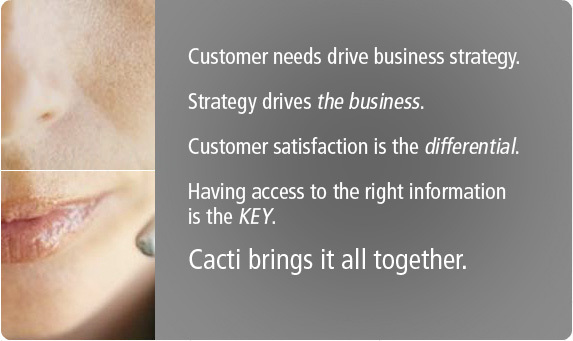 Cacti's software is designed to enable companies to optimize their customer satisfaction, training, and overall quality assurance environment. By capturing information from any one of these valuable mediums, companies are able to generate additional revenue opportunities, improve profitability, enhance customer retention and achieve greater customer intimacy.